Over the past few years, our family has been working very hard to become debt free. It is definitely a family task. We all have to remain focused and remember wants vs needs. As race to get out of debt nears the end of stage one completion (paying off all our consumer debt except the mortgage), we are realizing the light at the end of the tunnel is not an oncoming train! The biggest key for us was making a budget and sticking to it! I often hear people talking about how much money they spend each week on food and eating out. This is definitely an area where you can pretty much miss the giant sucking sound of money leaving your wallet! The first step to making a basic food budget, isn't dealing with the money. Menu planning is crucial because it means you are aware of what you are eating at each meal. It means, you are making sure you have all the ingredients you need for the week. And, making those awful trips to the store on the way home wondering what on earth you are going to make for dinner. Which leads to step two: Shopping with a List. Go to the store once, with your list. Get what you need. Get out. Stick to your list! This eliminates all the extra trips to the store for one thing, that usually ends up costing two to three times what you intended to spend. how much you're going to spend. I wish I had a great formula for you. I don't. This part really depends on your family, what you eat and what sorts of stores you have available. This is what works for us and our family of 8. 1. The Protein Budget: I shop for proteins once or twice a month. When I see a great sale, I stock up. I went three months without buying chicken. We eat vegetarian a couple times a week. I am able to save more money on proteins by shopping at Costco for some items and hitting the markdown meats for others. If you are concerned about buying chicken that's marked down, for example, you poach it in the crockpot then shred it and freeze! Bonus #1: you have pre-cooked chicken ready to toss in casseroles, soups or stews. Bonus #2: You now have chicken stock, that you can also freeze and use in recipes instead of buying at the store. 2. Produce Budget: Because I am able to shop at the Farmer's Market year round, I have a budget for produce. During the summer, I don't really use this because we do have a garden and friends who also share their garden bounty. Next year, I plan to make my garden even bigger so I am able to put up more goodies for the fall. Here are some ideas for saving money on produce. This week, I spent $9 at the Farmer's market and brought home onions, plums and about 7 lbs of culled fruit we need to eat NOW! Which is fine, because as soon as the kids saw the basket, they attacked it. 3. Pantry Budget: This is the money spent at the store. How much are you planning on spending at the store for your pantry. For me, this is also my coupon shopping budget. I call it a pantry budget because this where you can really get ahead of your food budget by stockpiling. I'm not talking Hoarders: Coupon Edition type stockpiling, unless you're up for that. Many people start out full speed couponing and burn out quickly. I'm talking more along the lines of figuring out how much you will use of certain items over the space of about 3 months, and stocking up at the bottom price using coupons. Once you have a good pantry, you don't have to rely as much on what's on sale that week for your menu planning. The weekly sales become a way to replenish what you use. Even if you're sure there's no way there are coupons for the things your family eats, keep in mind some of the best coupon values are on things like toothpaste and toilet paper. So even if you can save on those items, it's still money you are saving! Every dime counts. 4. Eating Out: I don't care for eating out often. I'd rather experiment with fun recipes and interesting ingredients at home. I still make a small budget for date night, which probably be included in another budget category, but I put it here for my convenience. That is basically how I do it to. I am definitely a protein stockpiler since when stuff we eat a lot (Chicken breasts, or ground beef) go on sale.. i buy a lot and fill the freezer. I am a Q'r too.. especially for things like cleaning supplies and toiletries. But I do have an affinity for eating out.. Oh how I love not having to cook! It is my vice! i am so proud of you dear daughter..you manage to do better and improve on the basic I taught you. you have actually succeeded on what I was trying to do while raising you and your brothers. It's really great to budget! Now matter how many times I try, it just doesn't work. Mainly because of my husband!!! Thanks for the great ideas. I already do some of these things and find it a great reminder to plan ahead my meals so I can be a better shopper. even though their policy says ad not necessary. 9 dollar produce budget?! That is an AWESOME success! I am desperate to shrink our budget each month. We are trying just as hard to get our debt down. We don't have any kids, but we don't want to start trying until we have all of our debt (besides mortgage) paid off. Its a total transformation! I feel for you! Thank you for sharing. This is great! Thanks for the tips. I'm really big on menu planning and lists and trying really hard to stick to my grocery budget. It was hard for me to give up eating out at first, but the more I cook for my family, the more I enjoy just staying home and making something.I'm coming from Motivate Me Monday. Thanks for sharing this on Saturday Show and Tell. I hope you’ll be back again this week with some more great ideas! We are currently doing the same thing at our place, I have an Ipad and Iphone and downloaded a free app which allows you to set up your menu planner on the Ipad and syncs the shopping list to your phone. It's been a huge help. Good luck with the debt clearance. 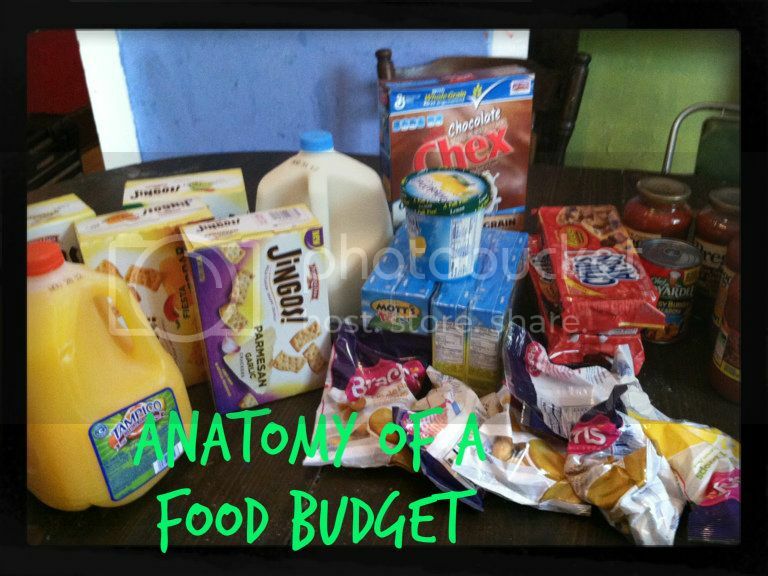 You nailed it with the statement "the first step in making a basic food budget isn't dealing with money." So true. Thanks so much for sharing on Busy Monday! I love how you laid this all out! Featuring this week at Mom On Timeout!